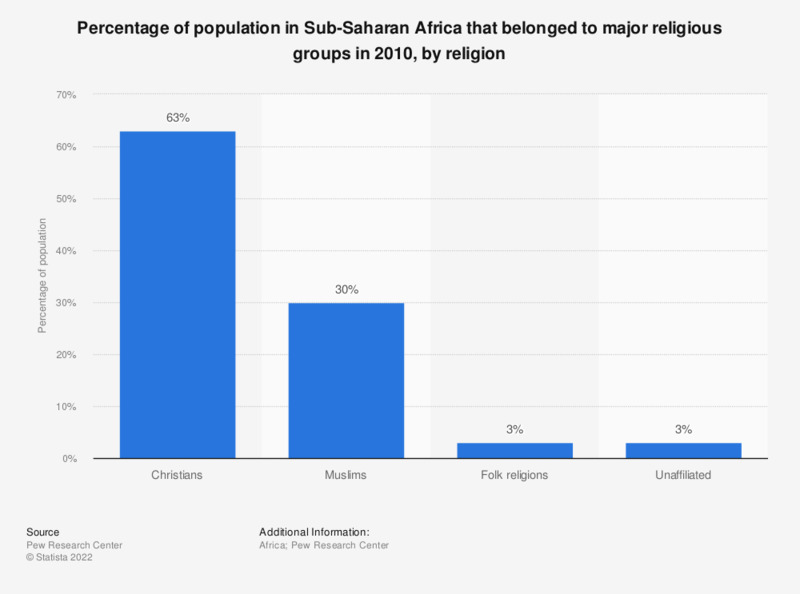 This statistic shows religious diversity in Sub-Saharan Africa in 2010, by share of religious population. In 2010, around 63 percent of population, in Sub-Saharan Africa, identified as Christian. Folk religionists include followers of African traditional religions, Chinese folk religions, Native American religions and Australian aboriginal religions. The “Other religions” category includes Baha’is, Jains, Sikhs, Shintoists, Taoists, followers of Tenrikyo, Wiccans, Zoroastrians and adherents of many other faiths. Figures may not add to 100% due to rounding. Unfilled data represents less than 1 percent of population share. How important is it to you that those you meet know that you are a Muslim? Religious groups: How would you rate your life now and your life in five years on a scale from 1 to 10?